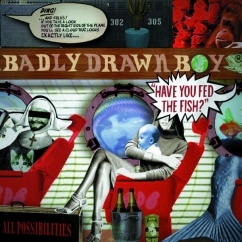 Revisit: Badly Drawn Boy: Have You Fed the Fish? Let Badly Drawn Boy into your evening. Badly Drawn Boy, né Damon Gough, is not a name one tends to hear a lot nowadays, but there was a time that he was not only a critical darling, but also something of a household name, especially in his native England, with albums high up on the charts and his songs on heavy radio rotation. He hasn’t released an album since 2012, but his catalog is well worth revisiting, and none more so than 2002’s Have You Fed the Fish? This was his third album, after his sensational debut The Hour of Bewilderbeaset and his quite underrated soundtrack album for the film About a Boy. On Have You Fed the Fish?, Gough swung for the fences, enlisting a stellar cast of musicians and producer Tom Rothrock, who just a few years earlier had produced Elliott Smith’s Figure 8, another amazing-sounding album that bears more than a few sonic traits with Gough’s. Like Smith’s album, this is indie Technicolor, an expansive record whose overall cohesion makes it feel like a concept album even though the “concept” in question is hard to define—the arc of a relationship, perhaps? Playing many of the instruments himself and aided by pros like Joey Waronker, Sasha Kristov, Danny Heifetz, Jon Brion and Pete Thomas (of Elvis Costello’s Attractions), plus a slew of guests on background vocals including Charlotte Gainsbourg, Gough created a cheeky album that pairs melancholy with humor, delving deep into the sentimental without missing the opportunity to catch a decent groove on the way. On such tracks as “All Possibilities” and “The Further I Slide,” especially, the bass, drum, back-up vocals and horns infuse the album with an unexpected funk and disco-inspired irreverence that can seem to be in tension with the sincerity of Gough’s lyrics, but in fact only heighten it, the way that so-called “guilty” pleasures can heighten one’s sense of a person’s taste more than the non-guilty ones. Elsewhere, there is a Queen-like grandiosity in unabashed rock numbers such as the title track, the exultant “Born Again” and the hit “You Were Right” (the one with the immortal “I’m turning Madonna down” line). But the album is as much one of quiet, reflective interludes as it is of boisterous fun, such as the 70-second acoustic “I Was Wrong” the cinematic, string-led instrumental “Centrepeace,” less than two minutes long or the ingenious, McCartney-esque “Imaginary Lines,” clocking in at just 46 seconds (“I’m falling out of bed, not out of love”). But the album’s high point may be “How?” which starts out as a plaintive reflection on mortality and morphs into an up-tempo jaunt powered by existential questions such as “How can I give you the answers you need/ When all I possess is a melody?” The seamlessness Gough achieves between meaning and form in pop songs like these is truly something to behold, as they can be enjoyed as much for their introspection as for their sheer musical delight. On more than one song on this album, Gough employs the line “I’ll get you tickets to what you need”—listening to Have You Fed the Fish?, the impression one has is of a traveling carnival that, for one night only, sets your heart’s murmurs to song. So turn the lights down low, and let Badly Drawn Boy into your evening. Rarely has a misanthrope made such a good master of ceremonies.